Best-selling author, blogger, speaker, and friend Stephanie Sarkis returns to the podcast on this episode. Recently, one of Stephanie’s blog posts went viral, and she was interviewed on CNN. This article was on “gaslighting.” She joins me on this episode to discuss this topic and the issues surrounding it. In this conversation, we use Stephanie’s blog piece on gaslighting to jump into a discussion on the current political environment. We talk about how the current climate is affecting us all as individuals. 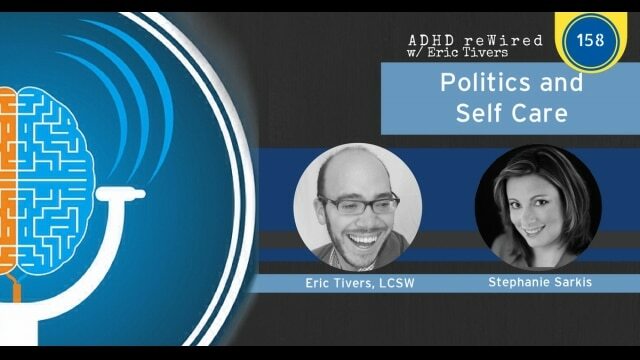 Stephanie shares how to practice good self-care, and we talk about how to engage in constructive discourse with those that we don’t agree with. In this episode, you will hear some of my personal political opinions. ADHD reWired is more than a podcast, we are a community. As a community, I want to bring people together so we can learn more from each other. These conversations about politics may be difficult; it’s my hope that these conversations can help us all become better listeners, communicators, and citizens. [08:39] – Stephanie talks about gaslighting, which is a series of behaviors that is used to manipulate. She explains what types of people use these behaviors. [10:49] – Stephanie did not write this article based on current political events, but people are becoming more aware of manipulative behavior in politics. [13:12] – Recent political events have caused people to obsess and struggle to function. Stephanie talks about self-care in these tumultuous situations. [19:15] – While talking about self-care, we talk about the role of exercise. [23:04] – Stephanie talks about the importance of being around people that lift you up, rather than bring you down. [23:42] – We talk about relationships with people who we disagree with politically. People struggle with knowing how to speak out appropriately. Stephanie shares some thoughts on this scenario and when it’s right to disengage. [28:22] – I recently posted some political thoughts on my personal Facebook page. This led to some back-and-forth with friends that disagreed with me. I share some of my behaviors in this discussion and Stephanie explains why communication can break down. [32:48] – Stephanie shares what we can do to get involved to be constructive with these emotions we feel. [36:14] – We talk about some of the work that groups like CHADD have been doing. [41:25] – I share what I have done to take action with my elected officials. Stephanie shares what we do and don’t have control over in these situations. [46:22] – Calling legislators can be intimidating for those of us that have phone anxiety. Stephanie talks about ways to get involved and contact legislators without calling them on the phone. [49:19] – There’s a lot of illegitimate news sources out there right now. It’s important to verify that the information you are receiving and using is accurate. [52:28] – While it feels like civic discourse has disappeared, Stephanie says that we are moving in the right direction. Our common goals will be what ties us together. [55:59] – We explain the loaded background of the term “snowflake” and the history of Japanese internment camps. [1:00:10] – Journaling can help you work through things if you are upset.